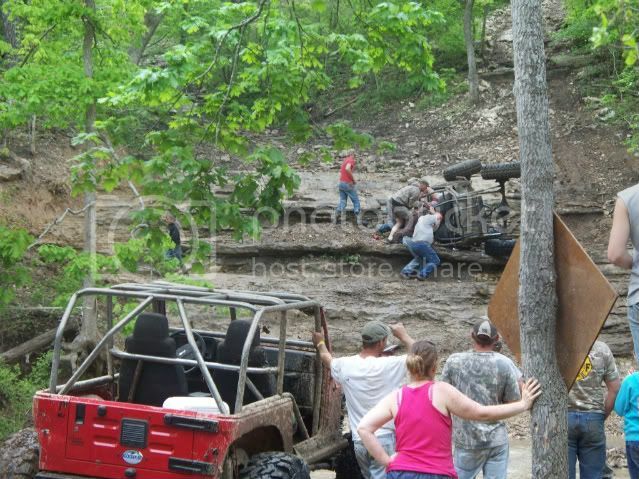 In place of the planned Hannibal Rocks run, we instead met near Seymour, MO at Southern Missouri Off Road Ranch (SMORR). Attendees were kskj (w/his son-in-law), MtnLuvr, MP Jeeper and us (yellocoyote & ihatemybike). We had never been to this park before, but I think we can all agree that we all really enjoyed the time spent there. 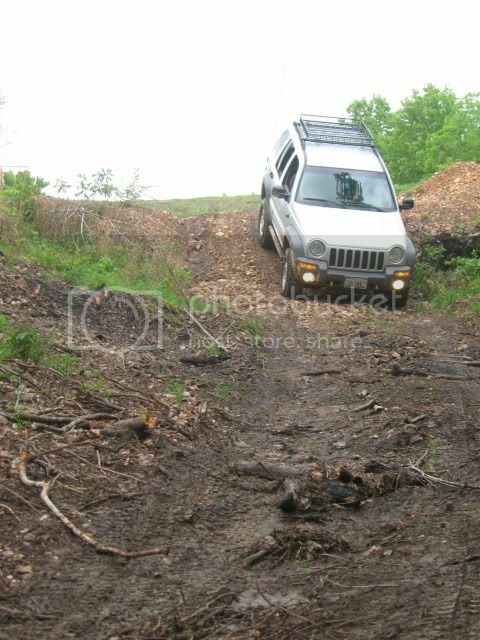 In comparison to most 'midwest' offroad parks I've been to, SMORR was a lot more organized - they have a great map of the trails, and all of the trails are clearly marked as to which trail and what difficulty they are. The campground was great too - people were friendly, clean facilities, snack shop style restaurant on site, and rules in place to keep things from getting too ridiculous in the late hours of the evening. We, in our KJ's/KK, felt very small here though... most of the vehicles running at this park were rather large lifted jeeps/broncos/etc, and rock buggies. 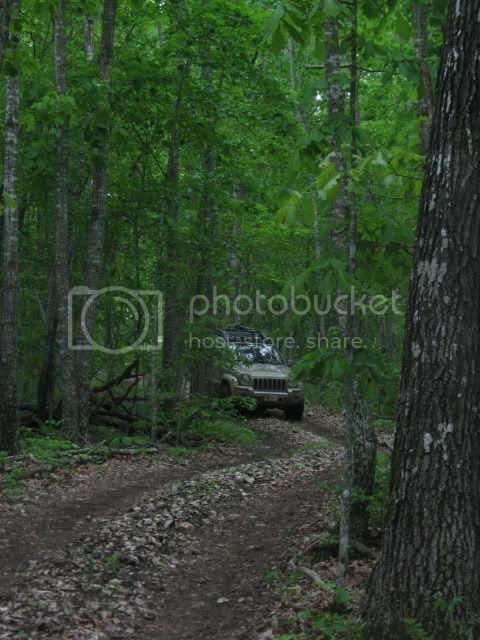 I think we saw one stock TJ at the campground that looked like it had been on the trail. Vehicle size didn't stop us though... we found enough trouble to get into. 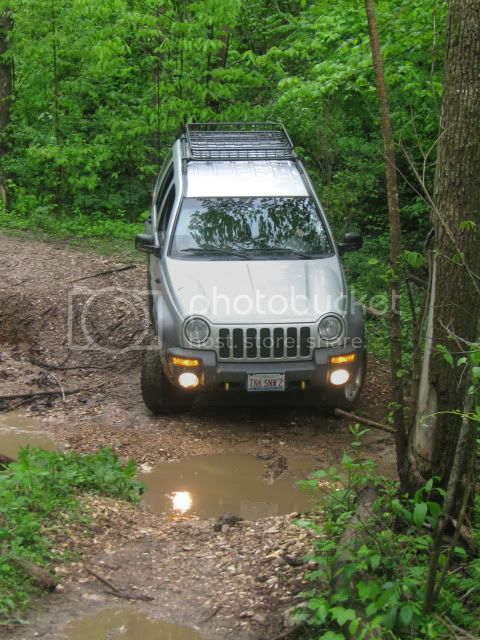 It rained off and on the entire weekend, which of course upped the level of difficulty on most trails. A normal level 2 trail became level 3, and so on. Most of our weekend was spent on level 2 trails... and a couple of 3's. Everyone had to be recovered at least once... some more often. The rest of us opted to turn around and go back out the way we came in... and met kskj back up on the main road. We met some friends of kskj in some built rigs... and tried to keep up... but eventually went our separate ways as to not slow them down. No lies... there was 10-year old boy driving this thing around. He was awesome! 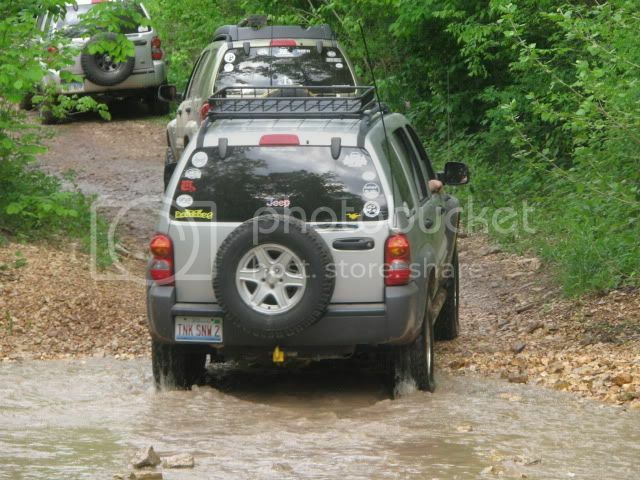 But even MtnLuvr's and kskj's MT's had issue in this Missouri mud... Some guys in built Broncos pulled them free. MtnLuvr and MP Jeeper went out for a run on Saturday night... I stayed back, feeling a little lucky that I had no damages and my KJ was good to go for the 9+ hour ride home in the morning. I didn't want to press my luck any further. We had a really good time, and was fun to see everyone again. I look forward to the next time we go to SMORR - hopefully in drier weather! I want to thank Yellocoyote For coming up with this great idea of getting our two groups together. We wanted to get the great plains and Illinois groups together after we met in Ouray last year. It was good to see everybody again and we had a great time. It was a long drive for yellocoyote and mp jeeper so thanks for coming down and wheeling with us. The great plains group is small so it is just Mntlvr and I most of the time. 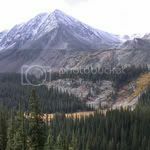 Here is a few of my pictures. 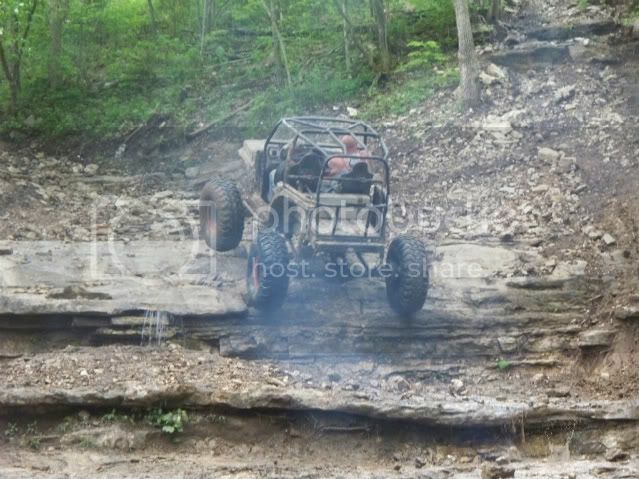 We had to stop and watch this Suzuki buggy go up a 5 rated trail. They just turned him back over and he went right up. 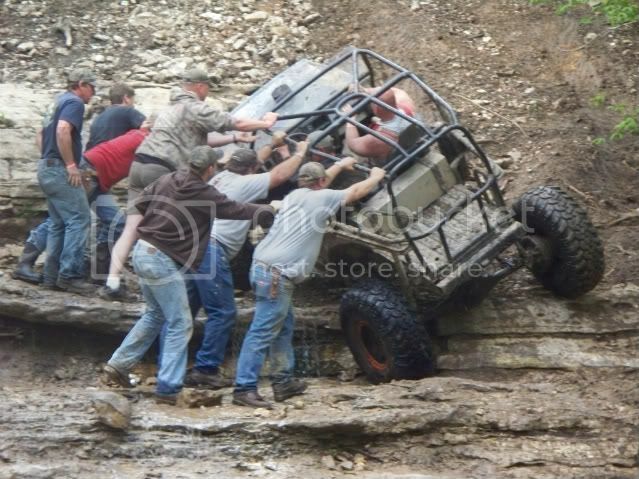 Mp jeeper trying out the rock rails. 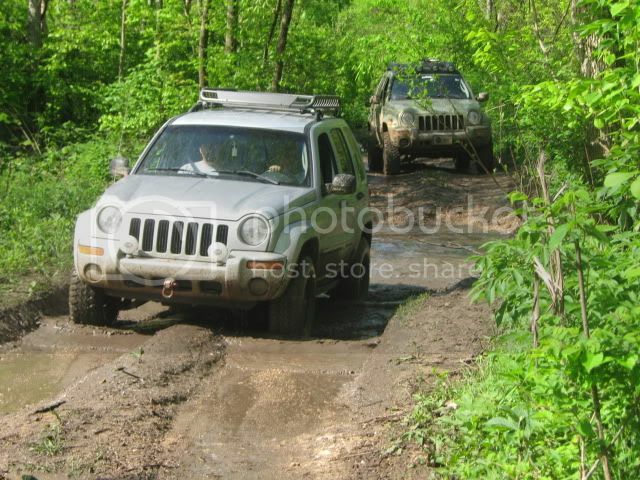 I was thinking about you guys over the weekend while we were up in Michigan for the Jeep Blessing. I was wondering how close those nasty storms got. Ditto kskj, Thanks Yellocoyote and MP Jeeper for coming down to wheel with us. Look forward to doing again sometime. 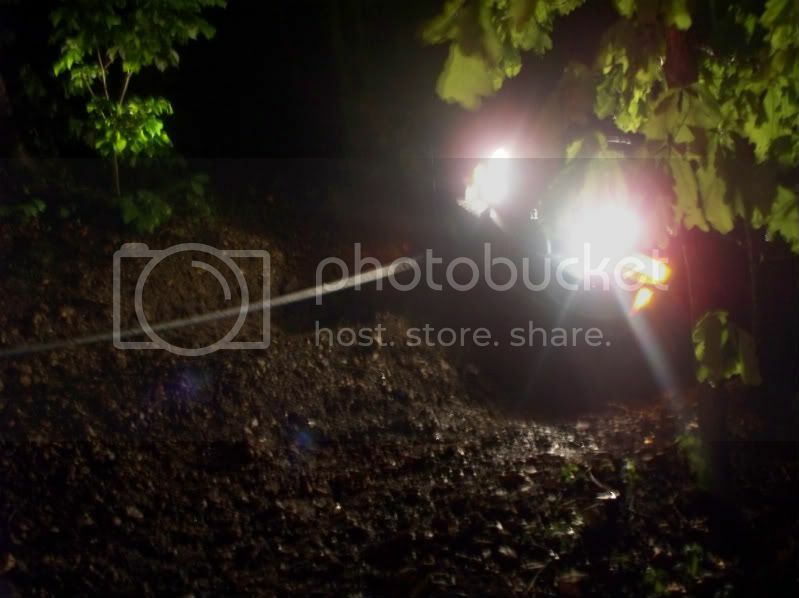 MP Jeeper during Friday night's 'Comanche Hollow' run. It was a good shake-out run to get our communications and team efforts (for recoveries) worked out. 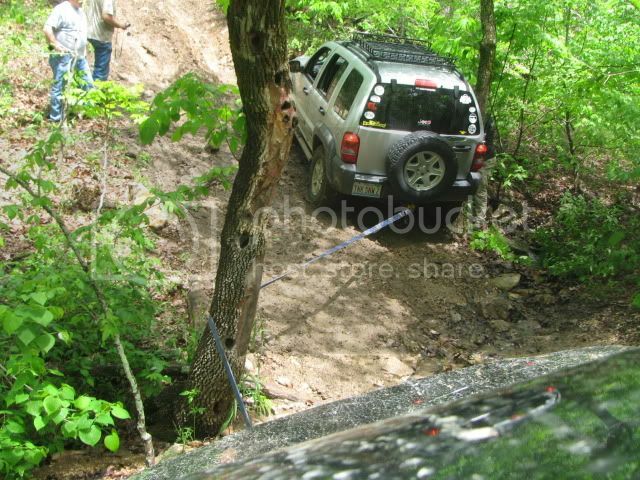 MP Jeeper climbing down a wet ledge. Any of the trails not up on a ridgeline were certainly plenty wet, muddy and soupy from all the week the midwest had been getting. Yellocoyote navigating the trail through a super-green forest. MP Jeeper cruisin' one of the nice (e.g. 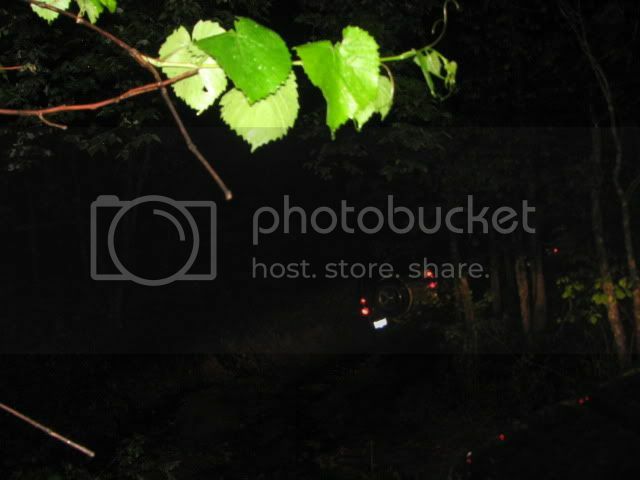 not soupy wet) trails. kskj leading MP Jeeper and Yellocoyote along the main 'Ranch Road' trail back to some new adventures. This Western part of 'Ranch Road' was neat because of all the creek crossings. 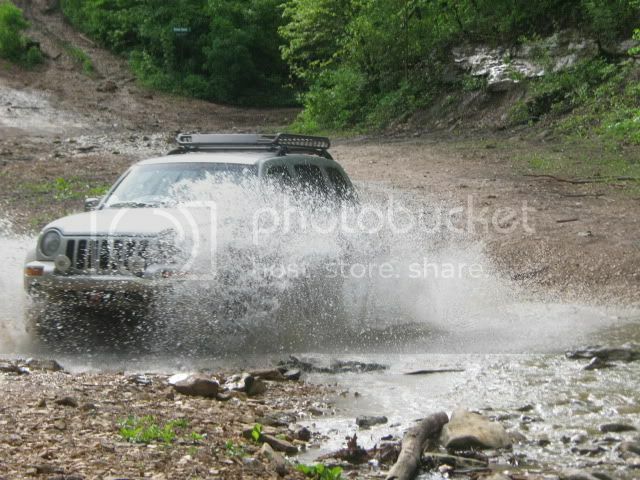 kskj making a splash on one of the many creek crossings getting to Sunday morning's trail runs. MtnLuvr's KK, still sporting some souvenirs from Triple Whammy during LOST's Moab GTG just a couple weeks before, is ready for more trail. MtnLuvr and kskj, both from Kansas, feel right at home dodging trees along the trails. kskj as we're heading down out of Sunday morning's run of 'Armadillo Pass' to head back to camp to start packing up. A great trip wheelin' and camping with great people. Even in spite of the rain and muddy, greasy, mess, it was a very enjoyable outing. We're really glad we came out there... despite the distance. I thought it was well worth it - to see you guys again, and the trails were pretty sweet too. Looking forward to the next time. I've wheeled SMORR before, it's a great place and the staff were pretty cool. Looks like fun! I have one word to say to all of you guys/girls, the word is called, “LOCKERS”. That would be the next greatest upgrade to help you tackle those trails with ease. 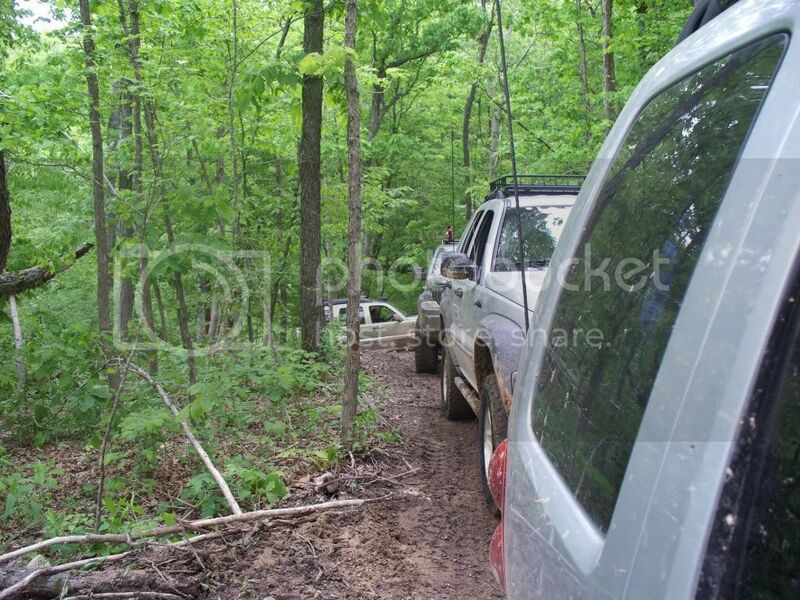 What i needed was a winch to get me out of that mess. LOL, yeah........ I think winches are awesome, but I think a front and rear locker would do wonders. Looks like a great time on some great trails.